Sign - BFPO 686 Postal & Courier Det, Metal. 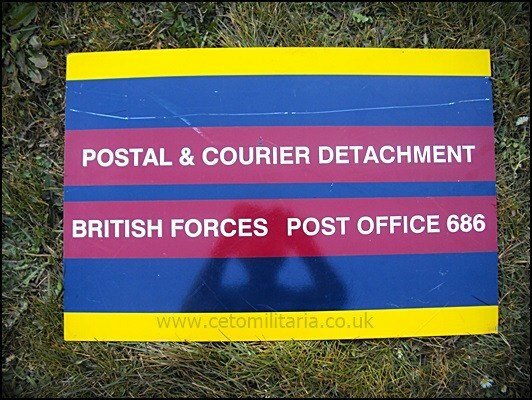 For sale, a metal sign, blue/yellow with "Postal & Courier Detachment British Forces Post Office 686". Size 23"x16". Bring back from Afghanistan. Collection from Lincoln, or free delivery to Billing 4x4 Show (13th April 2013) or War and Peace at Folkestone (17th-21st July 2013). Sign - "Keep Out" Metal, Military.